Everything a student needs to succeed in one place. 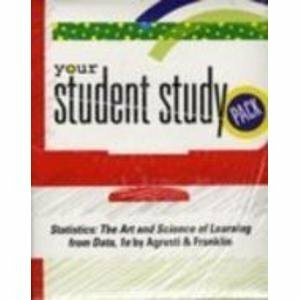 Student Study-Pack contains: O Student Solutions Manual Fully worked solutions to odd-numbered exercises O CD Lecture Videos A comprehensive set of videos, tied to the textbook, in which examples from each chapter are worked out by a statistics instructor. The videos provide excellent support for students who require additional assistance, for distance learning and self-paced programs, or for students who missed class. O Technology Manual Contains detailed tutorial instructions and worked out examples & exercises for: TI-83 Calculator Excel (including PHStat, an Excel plug-in) SPSS Minitab O PearsonTutor Center Tutors provide one-on-one tutoring for any problem with an answer at the back of the book. Students access the Tutor Center via toll-free phone, fax, or e-mail.